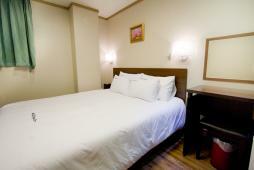 Reasonable hotel only 1min walk from Dongdaemun station, subway line 1! 2015.03.05 : The hotel name changed to GLOBAL INN seoul dongdeamun citydays inn from City days inn. 24/7 city Dongdaemun is the center of shopping and its location is very convenient to access other major tourist sites in Seoul. Global Inn Seoul Dongdaemun Citydays Inn is the reasonable hotel which opened in 2012 in Dongdaemun area. The hotel is perfectly located only 1min walk away from Dongdaemun station, subway line 1. Once visitors enter the entrance, they will find the front desk, rest area and the business area. There are 36 rooms with a selection of family, deluxe twin, twin and double room. All rooms are equipped with Wi-Fi connection and free mineral water is provided. Necessary amenities such as hair dryer are also prepared in the room. There is also a non-smoking room. The hotel is well secured with staff at the front desk for 24h. the entrance is locked by a pin code and the card key for the entrance is provided to guests. The location is within a good access to Dongdaemun market, Jongno area and Daehangno area. * The hotel doesn't allow to minor stay without parents.